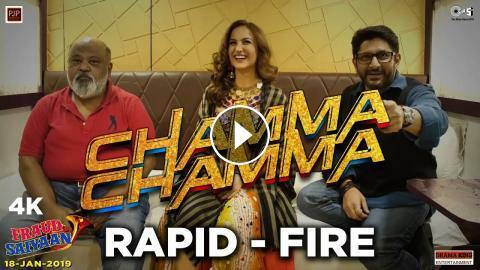 Enjoy the fun-filled rapid fire session with the ultimate Chamma Chamma trio- Saurabh Shukla, Arshad Warsi and Elli AvrRam. The song is sung by Neha Kakkar, Romy, Arun & Ikka; re-created by Tanishk Bagchi. Fraud Saiyaan is slated to hit the cinemas on 18th January 2019.